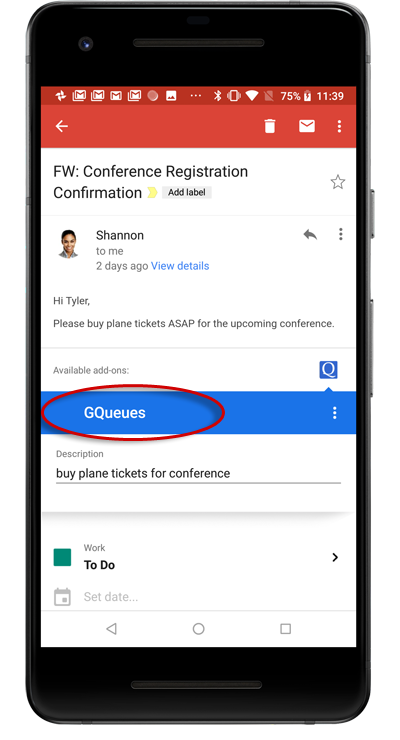 The GQueues for Gmail Add-on allows you to create tasks out of emails, modify tasks and complete tasks directly from Gmail. The GQueues for Gmail Add-on is available only for GQueues users with a paid subscription or free trial account. Click the button below to install the extension from the G Suite Marketplace listing. The first time you click the Add-on you will be prompted to authorize it to access your account. The final step is to link the Add-on to your GQueues account by signing in. You may also be prompted to authorize access during sign in depending on what features you've already used in GQueues. To turn an email into a task click the GQueues button that appears on the right when you are viewing an email. A new task is started with the email subject automatically inserted as the task description. Modify and add the necessary information for the task and click the Create Task button. 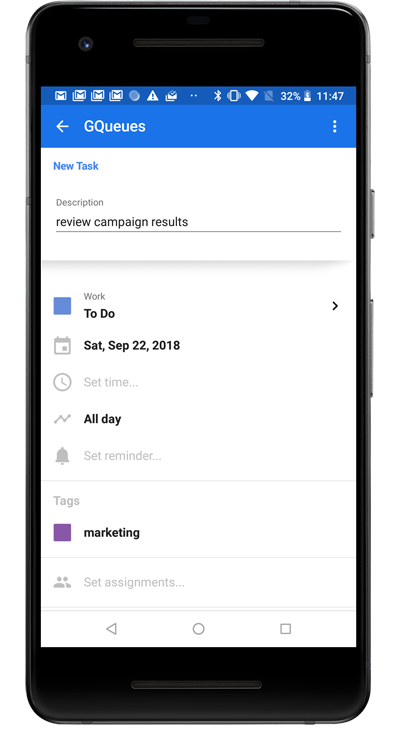 In the Gmail app for Android and iOS, to create a task from an email scroll to the bottom of the email and tap the GQueues icon in the Available Add-ons section. To view the Add-on in full-screen mode tap the header bar and it will expand. Set the details for the task as desired. Scroll to the bottom and tap the Create Task button. There are two ways to associate an email with a new task. Attach current email - This option attaches a copy of the email (and any email attachments) to the task itself. This option is ideal when you are sharing the task or assigning it to someone else. Since others don't have access to your email account, by attaching a copy of the email to the task you allow others to see the email directly inside GQueues. Link current email - This option inserts a link to the email into the notes of the task. When you view the task in GQueues, you can click the link which will open up the actual email thread in Gmail. You can set the default way to associate an email with a task by configuring the add-on's settings. When your create a task using the Attach this email option a copy of the email is attached to the task. Click the attachment to view the email directly inside of GQueues. 2. If the email body itself includes links to GQueues tasks the Add-on will display them in a list which you can click to view (provided you have proper access). 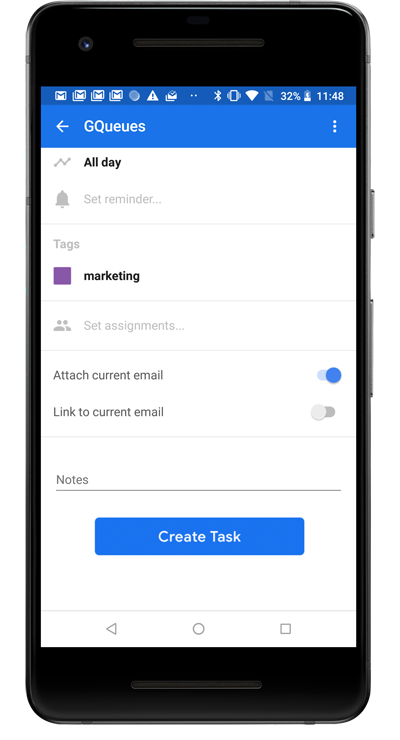 You can modify your own tasks or tasks in collaborative queues directly in the Add-on, including marking a task complete or updating the task details. You can add comments to assignments and mark them complete directly in the Add-on as well. To attach an email to an existing task open the menu and choose Search for Task. Enter a word in the task description or notes and click the Search button. Click on the desired task in the search results. Choose to either attach the current email or link the current email to the task. The email is now attached or linked to the task, depending on your selection. To configure the Add-on open the top menu and choose Settings. Here you can choose defaults for the Add-on or disconnect your account if necessary. The extension periodically syncs with your GQueues account in the background to ensure it is using the most current list of queues, tags and assignees. If recent changes were made in your account that are not appearing in the extension you can click the Refresh button to force a sync and see the latest data. If you have installed the Add-on and do not see the GQueues icon, the Side Panel in Gmail may be hidden. To show the Side Panel click the button at the bottom right of the page. The Side Panel will appear and show your available Add-ons. If your users see an "Unavailable for Install" message when they view the GQueues for Gmail Marketplace listing, you will need to add GQueues to your whitelist to enable users to install the Add-on. Read about whitelisting Marketplace apps here, or go to the page shown below in your Admin Console and click on "Manage Whitelist." In the pop-up that appears, search for GQueues, click the checkbox for both apps and click "Whitelist." NOTE: This does not install the Add-on on everyone's account, it just gives each user the ability to install it if desired. If you want to install the Add-on for everyone's account in your domain go to the Marketplace listing, make sure you are signed in with an Admin account and click the "Domain Install" button. 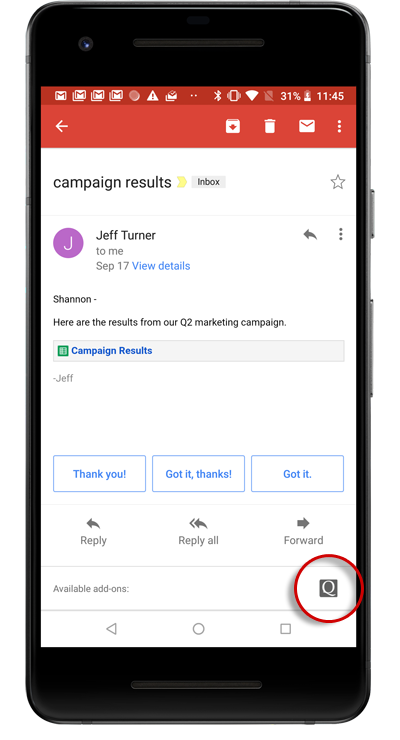 Click the menu on GQueues for Gmail and choose Remove. The GQueues for Gmail Chrome Extension was the original way you could create tasks out of emails. The extension is still available, but it only works in Chrome on the web.